Richard Kall is a network marketing icon and most people in our industry have never even heard of him. He has earned tens of millions of dollars during his past thirty plus years in the industry. He first joined the network marketing industry in 1978 (Amway) and he has achieved top earner positions in several different companies. He also happens to be the mentor of one of my favorite mentors of all time, Mark Yarnell (now deceased). Richard Kall mentored Mark during their time together in Nu Skin. Mark always spoke very fondly of Richard whenever he talked about him. Although I have never met Richard Kall in real life (yes, I would love to) I can tell you that he is a man’s man. He calls things as he sees it. He doesn’t sugarcoat things or tell you what you want to hear. He speaks the truth. I respect him for that. I requested a free copy of his book “The Definitive Guide to Network Marketing” right off his website. I printed it out on my printer and read it in one setting. I then read it again. Then I read it a third time. This little book has tons of golden nuggets in it that would benefit ANY network marketing professional. My objective today is to share some of my favorite Richard Kall quotes from his book. Each quote is in bold and italics. After each quote, I will share my own two cents on it. The quotes are listed by where I found them in the book. Enjoy. # 1 The reason most people don’t treat their opportunity like a big business is because it doesn’t cost $50,000 or $500,000 to get in. I couldn’t agree more. If people had more “skin in the game” financially they would be more likely to treat their business seriously. When you don’t have much money invested in your business it’s easy to make excuses or do nothing. A traditional business owner who invested five or six figures to start a business would never think that way. # 2 No one ever gets anywhere in life working for someone else. There’s nothing wrong with having a job, although it is a hard way to attain financial freedom. The wealthiest people in the world own businesses. # 3 If you don’t think you can, you never will. We become what we think about it. Thoughts are things. You must have belief in yourself, your company, your product line and the industry, if you want to succeed. # 4 If you can turn yourself into a robot for 60 to 90 days and do the same thing over and over you will be successful in network marketing. To be successful in our industry you simply need to do the same things over and over and over, so you can create new habits. You need to focus on the income producing activities. This is a business of talking to people. All of your time should be spent retailing and recruiting. # 5 They may not get in, but they are watching you. Everyone you talk to is watching you. People expect you to do nothing and quit the business in 90 days or less. If you quit, you prove them right. If you stick with it, and build it big, many people who tell you NO today will eventually join your team, or they will ask if you are hiring. # 6 Every one of us has that sleeping giant inside of us. We all have the potential to do something great with our lives. It’s simply up to us to awaken that sleeping giant. # 7 Remember, whatever you do will be duplicated by the people you sponsor. Keep everything so simple that even an eight-year old could do it. The beauty of our industry is the simplicity. Any fool can complicate it, and most people do, but it takes a genius to keep it simple. # 8 Never prejudge people. It’s not your job to judge people. By all means, pre-qualify people, but never judge someone. Share your products and business opportunity with everyone you talk to and let them decide for themselves whether or not they want to get involved. Besides, people will surprise you. The ones you think will “get in” won’t and the ones you think would never join do join. # 9 You never know what stage of life people are in when you invite them to hear about an opportunity. Getting people to join the business all comes down to timing. Everyone can be a good prospect, if the timing is right in their lives. Stay in touch with everyone you talk to every few months, because the timing in someone’s life can change in an instant. # 10 You never know where it will come from. You never know who your next ACE will be or when they will show up. Typically, your best people will not be personally sponsored. Instead, they will show up many levels deep in your organization. # 11 The basic rule of thumb in this business is that quality people lead you to quality people and “eh” people lead you to “eh” people. The smartest thing you can do is sponsor up. Look for people at your level of motivation and higher. Recruit people who would do well in the business, not people who NEED the business. # 12 One of the biggest mistakes a person makes coming into network marketing is wasting too much time with the wrong people. Work with the people who deserve your time, not with the people who need it. You can’t make anyone successful in this business. That’s their job. Work with the willing. # 13 Look for someone who is successful already. It doesn’t matter what they are successful in. People who are already successful in life typically do very well in our industry. These people normally have credibility, contacts, and a great work ethic. # 14 Look for someone people will follow. Look for people with a large sphere of influence. Look for leaders. These are great prospects. # 15 It’s the ones who stick around long enough who succeed. This business is a marathon, not a sprint. It takes time to build a successful business of any kind. You must pay your dues. Plus, it takes time to master your skills. Most top earners have been with their current company at least five to ten years. # 16 The object of building a group is not quantity of people, but quality of people. At the end of the day you are looking for five to ten quality people that you can build a dynasty with. Distributors and customers come and go like the common cold, but leaders build it big. You are ultimately looking for leaders. # 17 Don’t nickel and dime this business to death, or it will nickel and dime you right out of the business. Don’t be cheap with your business. Be smart about how you spend money, but don’t be cheap. Be willing to invest in your business. # 18 I didn’t get into network marketing for the product, I got in for the opportunity, and that’s why 99 percent of the people get in. Lead with the business and then offer the products to your prospects if they are not interested in the business. Your real product is the business opportunity. Very few people you talk to will want your products but everyone wants more money! # 19 Many people use advertising as a sponsoring tool. My advice on advertising is not to use it until you’ve exhausted prospecting everyone you know. Only advertise as a last resort. Start with your warm market. This is a warm market business. # 20 But in this business, people with no credibility as a rule don’t do very well. You are looking for people with credibility, people who are successful, and people with a following. When these folks speak, other people listen. # 21 You must be consistent with whatever you are doing. Consistency is the key to long term success in our industry. You need to work your business every single day. No excuses! Whatever you do, don’t start and stop. That’s what most people do and it’s the kiss of death in the business. # 22 If you dress for success, you will feel successful, and if you feel successful, you will be successful. People will judge you by the way that you dress. Dress to impress. Strive to make a great first impression with your prospects and team members. # 23 You are the most important person in your group. The first and most important person to sponsor is yourself. If you don’t believe in what you are doing no one will join you. # 24 That signed distributor agreement is useless unless that person knows how to duplicate his or her own efforts. If you don’t have a game-plan for your new distributor, they will more than likely fizzle out and quit in 90-days or less. # 25 In general, I recommend staying in close contact with your new distributor until there are four or five people in depth in their line, and at least one leader type has emerged. Build depth in each leg and never stop. Always work at the bottom most point of each leg, with the newest, most excited distributor. People are less likely to quit when they have something to lose. # 26 If they are not serious, you will only be wasting your time trying to motivate them. You can only lead a horse to water, but you can’t make them drink. All of the time you spend trying to motivate unmotivated distributors is time wasted. Instead, go find some new distributors to work with. # 27 Your time should be spent with that excited, ambitious individual. Work with the most motivated people on your team, if you want to work smart. In addition, work at the deepest level in your group, with the newest, most excited distributor. # 28 You must be a product of the product. Use all of the products your company makes and be your own best customer. Be a product of the product! This will build up your belief in the products and give you a great product story to share with others. # 29 Don’t let the retail part of the business scare you. It’s a lot of people doing a little. I’d rather have an organization of one thousand people doing $100 each, than an organization of one hundred people doing $500 each. This business is about a lot of people doing a little bit, not a few people doing a lot. Don’t confuse network marketing with direct sales. # 30 If they love the product they will naturally recommend it to friends. People naturally share things that they enjoy with others. Distributors and customers who love the company’s product or service will share it with other people (because they love it). # 31 People sell every day of their lives, especially when they believe in something. We are all salespeople, whether we admit it or not. We all sell our ideas every single day. Selling is nothing more than getting someone else to see your point of view. # 32 One way of getting customers is to wear buttons extolling your product’s virtue, or a cute t-shirt doing the same thing. This is one of the simplest ways to strike up conversations with people and meet new prospects. You can have a custom button made at your local office supply store for less than five dollars. # 33 I would never become a distributor where none of the principals were ever distributors themselves. You want to work with a company that is distributor focused. Ideally, the owners or management team has experience in the field, as distributors. # 34 Look for a company that has long range goals. You want a company that is positioned for long-term growth and stability. You want a company that can be your forever home, so you really can create a long-term residual income. # 35 Try to stay away from start-up companies. Look for established, reputable companies to work with. Don’t join a company unless it is at least five to ten years old. Most new companies in our industry fail. The last thing you want to do is join a start-up, only to have it go out of business a few years later. # 36 It’s usually not your organization’s fault if you’re not doing well, but your own. Take responsibility for your own business if you want to be successful. You have no control over what anyone else does. Focus on what you can control: your activity! # 37 The average man at age sixty-eight has less money that he did at age eighteen, and that’s after fifty years of hard work.The traditional plan of making a living does not work out very well for most people. Network marketing offers the average person an exit strategy from the rat race. What we offer is a better way! # 38 This business requires a great deal of self-motivation. If you aren’t naturally self-motivated, you won’t do very well in this business. It’s up to you to wake up each morning and tackle the money producing activities in your business. Lazy people never make it to the top! # 39 You must believe in the product or products sold through your organization. If you don’t believe in what you are selling you won’t do very well in the business. The products must be great quality and provide an amazing value to both customers and distributors. 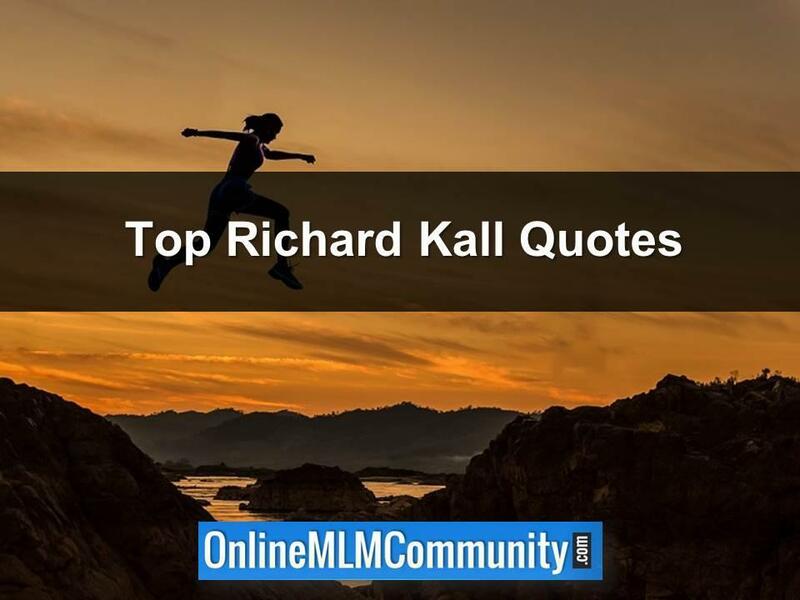 In review, these are my favorite quotes from Richard Kall quotes from his great book “The Definitive Guide to Network Marketing.” Overall, I give the book 4 of 5 stars. I think it is worth reading two or three times, so you can learn from the Grand Master himself. On a side note, if you have ever worked with Richard Kall personally, I would love to hear from you. Please leave a comment below to share your story, or to tell me which quote listed above is your favorite. You can check out this link to get a free copy of the book. I believe I should get this book and read it. I have several books on the list to read now, but this one is getting added to it. One that caught my attention after re-reading this post is #30. If they like the product, they will naturally recommend it to their friends. This is the exact reason why we should always be asking for referrals, especially with users of the products. When speaking with the referral, it is a good idea to mention the name of the person that referred them and tell them how much they love the products. It works, but many network marketers seem to fear asking for referrals. You can get a free copy right on his website. #3. I remember the story of the fire engine who tried to get up the hill. When he said he couldn’t he wouldn’t, but when he said, “I think I can,” he did it. #28.If we use the products, people will take notice and will be more willing to try them too. #35. I too believe that start ups are a dangerous risk. It is much better to work with established companies that have worked out all the bugs. Thanks for sharing these quotes Chuck. I learned some new things.